Face-painting, glam rock, mega band Kiss gave their fans one last guitar smokin’, fire-breathing, pyrotechnic tour of Australia during April. When they first cranked out ‘Rock And Roll All Night’ to Australian fans twenty years ago, their sound quality could not have hoped to match the clarity and coverage of this tour. Jands Production Services provided the JBL VERTEC Line Array System for the first time for a full nationwide tour of major entertainment venues, including the Burswood Dome in Perth on April 1 and concluded on the Gold Coast on April 13. 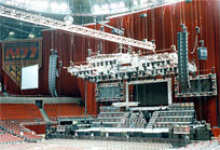 The 36, 4889 VERTEC cabinets were flown in two columns, 18 deep on either side of the stage and they were powered by Crown MA 5002 VZ amps.